A somewhat reduced talent field, the 1962 World Championships – the first on American soil - featured 8 nations, with the self-omission of both The Soviet Union and Czechoslovakia as a retaliation of the boycotting of the tournament by the US and Canada the previous year in Moscow. 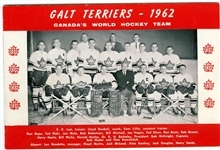 Taking place from March 1st to 12th in Colorado Springs and Denver, the Canadians were represented by the Galt Terriers, and losing just a single match to the undefeated tournament-winners Sweden, the Terriers took home second place, with the Americans in tow finishing third. Long-time NHL standout and recent NHL-retiree Tod Sloan augmented Galt’s line-up, joining the Terriers for the championship soon after finishing a trio of seasons with Chicago where he was crowned a Stanley Cup champion for the third time. Originating directly from the Sloan family, we have the Galt Terriers wool sweater worn by Tod at the tournament, along with a pair of Terrier pins and a tie clip. 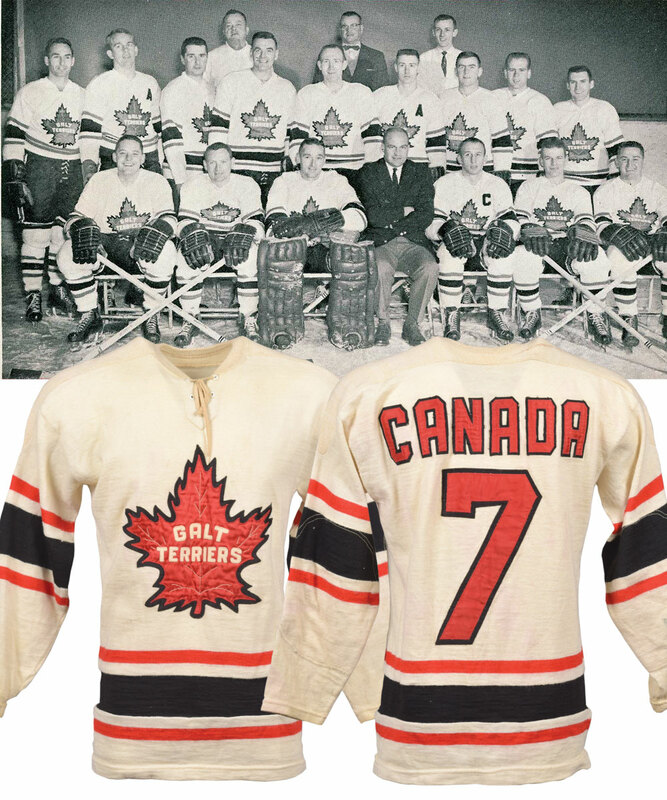 Currently void of any labeling and measuring-out to roughly a size 46, the cream-coloured wool feature’s an attractive and detailed layered deep red maple leaf team crest with “Galt Terriers” affixed in small off-white felt letters, with “Canada” and “7” over verso in matching red-over-black tackle twill. Red and black striping bands have also been utilized over the sleeves and waist, along with four-eyelet configuration on tie-neck construction. An LOA from the Sloan family will accompany this marvelous wool sweater. The sweater survives in especially pleasing condition featuring extremely bright and vibrant colours, with absolutely no obtrusive wear or damage. A 5” rust-coloured line appears over the reverse of the right shoulder, with pilling over each lower sleeve encompassing the elbows. There is also some very faint red staining over the reverse. The accompanying pins include matching ½” maple leaf-shaped examples with green enamel, with “Canada ‘62” along the base, while the tie clip again features a maple leaf with both green and red enamel, with “Canada 1962” along the base. The tie clip shows moderate wear, with the pins exhibiting just very light use. Sloan would finish the 1962 World Championships with an impressive 10 points in 6 games, including 6 goals.